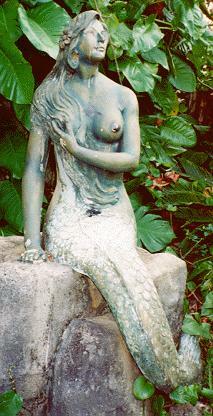 One fateful day, Sirena's mother sent her to get coconut shells to be used as coal for the iron. Oblivious to time and duty, Sirena couldn't resist the refreshing river. There she swam while her mother called impatiently. Sirena's godmother happened to be visiting, and as her mother angrily cursed her daughter with the words, "Since Sirena loves the water more than anything, she should become a fish", her Nina (godmother) quickly interjected, "leave the part of her that belongs to me". Unknown to mother, godmother, family and friends, Sirena was never to return home again, for feeling unusual sensations as she swam, she soon discovered that from the waist down she had become part fish. Her mother, regretful of her curse, could not undo the outcome of fate. Bidding her loved ones farewell, Sirena swam out into the Pacific. Since her disappearance, seafarers have reported seeing her in different parts of the world. According to legend, she can only be caught with a net of human hair.